Q1. What types of projects can ALittleConcrete.com complete? Q2. What information do you need from me? For your free estimate, we need some basic information about your project such as the type of work, a size estimate (width and length in feet) and whether your project is within 12 feet of your road. (Not to worry, many projects are not this close, but we need to know for the estimation). Q3. Is my project too small for ALittleConcrete.com? As we said, concrete projects come in all shapes and forms. If you need it done we can help. Q4. Is this going to mess up my yard? Part of the reason we need to know where your project is located on your property is to protect your yard from damage. Concrete can be placed anywhere on your property without having trucks or equipment enter your yard. 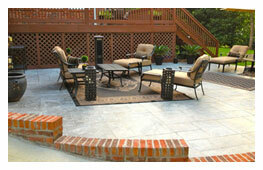 Each project is different, but with careful planning, your project can be completed with no damage to your yard. Q5. Will I need to be home while my project is underway? Not necessarily. We do not discourage anyone from being present during the work. Our goal is to be very clear about your vision before we begin to avoid having to interrupt your schedule. However, if you choose to supervise, we understand completely. Q6. How thick is the concrete you will place? We recommend and will not place anything less than a 4" depth. Some projects may require additional depth based on their end use. Our estimate system will automatically choose a depth based on the type of project you select. Q7. Why do I see "lines" all over concrete and will they be on my project? All concrete will crack out of necessity because it needs to expand and contract. "Lines" in the concrete are known as expansion joints and are the method used by concrete professionals to help the concrete crack neatly. Expansion joints may be created in several different ways depending on the desired appearance. Some examples include: 1)Sawcuts which are placed after the concrete hardens and are cut with a special saw. 2) Tool joints which are placed in the concrete with a special tool when the concrete is still in its plastic or non-hardened state. Joints may also be created by placing wood or other materials in a pattern into the concrete just before or as it is being placed.